Some video clips I create myself or that I shoot during concerts. The video installations were very impressive, here are some short loops I took quickly during my 2 days there. One of the very cool consequences of being a visualist coder is that you come in contact with a lot of inspiring peoples. Sometimes you even get to meet people that you knew before starting your project and company. This is what happened with Michel Huygen, the soul of Neuronium. I have always been attracted by electronic music that has it’s roots in the Berlin culture at the time when the city was a closed place. Neuronium music is following the heritage of this movement but with a unique touch that give the music his unique cosmic feeling. I know Michel Huygen since a long time because he was an early user of ArKaos software many years ago. Not every musician has like him such visual sensibility. Another inspiring person I got the chance to meet is Eric Wenger, the creator of many cool applications such as MetaSynth, ArtMatic, ArtMatic Voyager and many years ago the original creator of Bryce, the first 3D landscaping application. 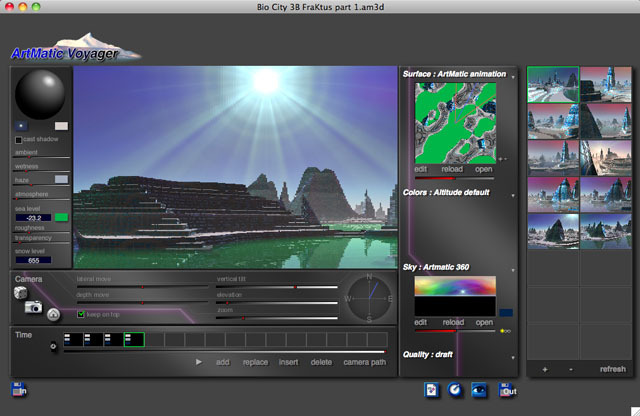 ArtMatic is a software based on mathematical graphs defining textures or height maps that are then used by ArtMatic Voyager for the generation of landscapes. I was listening some Neuronium tracks a few months ago when I realized that the music matched very well with some of the ArtMatic worlds. At the same time I received a message of Michel Huygen informing me that he will come to Brussels to present some of his graphic works. and his latest cd’s I used that opportunity to start rendering a few loops and presented that to him during our meeting. Michel was very enthusiastic about this idea so I did push it to the end and here is the result. All the segments took one month to render, for this work I used a MacMini that I have a home. 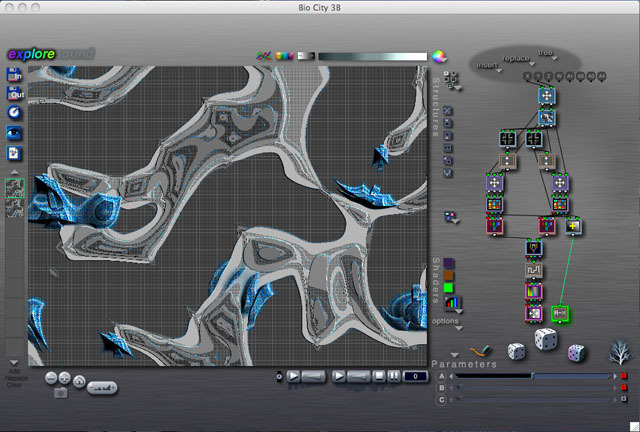 I then assembled everything in Final Cut Express. Hope you enjoyed the ride, the music is fantastic and the capacity of ArtMatic Voyager is just endless! I just finished a new video: “Serge Devadder – Nadir” from the compilation Euphony 1. I am a long time friend with Serge and last time we met he gave me the Euphony 1 compilation. During this meeting I did show him some of my video work and we talked about visualizing his music. Serge gave me some suggestion and asked for a black and white video. I started listening to this track and liked the progression with the percussion coming at the end. I quickly made a proposal for Serge and reworked it during a few months and here is the final result. I collected those video loops in 2009-10 on various locations : Californian and Irish coast, Polish Mountains, water reflections in Belgium and some stones from Cyprus. You can play it in HD if you watch it directly on YouTube. I found this documentary a few days ago and found it fascinating. While we just turned the page of the 2000s it’s nice to reflect for a few moment on my cultural roots before we continue our explorations. The documentary itself speak about Krautrock, but it’s a term I always hatted. 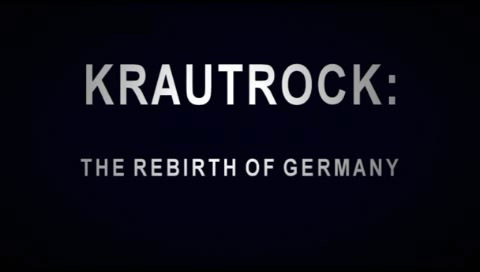 They explain in depth the origin of the term Krautrock in the documentary. For me the right way to name this movement is Berlin School of electronic music. The electronic music appeared all over Germany, not only in Berlin, but the cold war made this place so special.